When looking for the perfect souvenir for your family and friends this upcoming Easter, nothing better than handcrafted template! Create your own unique Easter cards with the help of these lovely templates from Sleeklens today. 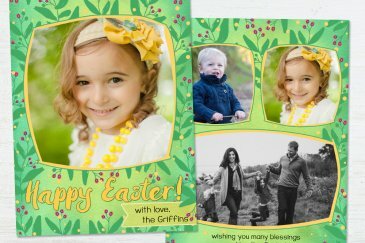 The easy to use Easter card templates have some unique and delightful effects which will leave your cards looking attractive and professional. 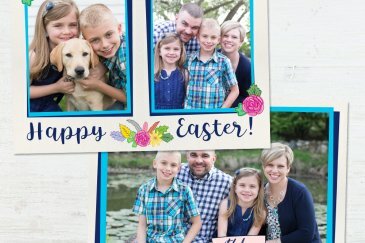 As a professional photographer, you can use these templates to create unique and unmatched Easter holiday cards to send out to your customers or even use them for commercial purposes as you create some for your clients to send out to their family and friends. Since they are fully customizable, it will be possible for you to create multiple lovely cards thus meeting different tastes and preferences. You can give your cards different looks by using different photos and also include different messages that resonate well with the recipients. There is no need for those boring Easter cards whose message might not really echo what is in your heart. Today, you can express yourself clearly and put your heart’s feelings on the two covers of this template ready for printing or sending in digital form. The Adobe Photoshop templates are easy to use even for people with no prior graphic design skills. Everything is already clearly done for you plus you will receive instructions to help you get started. The templates also have some very easy to use tools including clipping masks which makes it easy for you to not only add your images by dragging and dropping but also resize them to fit well within the provided space. Clipping masks will make your work easier than cropping tools and the results are always clean and attractive to behold. Say no more plain white boring Easter cards or monotonous pastel colored eggs by embracing this Easter card template today. It comes in some captivating colors and background design which will definitely help you create unique card designs for yourself or clients. If you want to create memorable effects in the mind of your prospective clients, this template will come highly recommended not only because of its colors but also the magical effects that is has to offer. Each of your cards can be unique as you personalize your message and change images to suit the target recipient. You can use the template to create cards targeting people from different genders and age groups. The template is right sized, coming at a dimension of 18 by 13 centimeters while at the same time giving you two card options to work with. Just create your unique Easter greetings cards within a matter of minutes by going through few simple steps. Just drag and drop your pictures with the help of clipping masks, resize them to perfectly fit on the template and then write your business information with the help of the different cute fonts available online. A list of fonts will be included in the package to help you find them easily online. This customizable Easter card template will help you create just the right impression with your clients without breaking the bank. Advertising your business can be a tough call especially where there is stiff competition. However, this template not only helps you send your heartfelt Easter wishes and greetings but to also advertise your business in a way that is unique and easy for your clients to connect with you. With eye-catching greeting cards, you can easily make your customers know that you have good thoughts towards them and also send your business details in a crafty way to different homes and offices across your town. You can also design some lovely cards for your clients and charge them for the same. While at it, these cards can also become your ambassadors in every home as you include your business information and logo where they are clearly visible. As you use those high definition photographs, everyone who comes across the Easter cards will connect with your skills and this increases the chances of turning them into your future clients. The Adobe Photoshop template has completely editable text and also comes with a list of fonts which you can use to customize your cards. Using the templates can help you save money and also give you the power to come up with the best style which will surely be good for your marketing purposes. You can also design your Easter cards from anywhere as long as you have the right software installed in your gadget. Each of the templates discussed above is compatible with Photoshop CS+, Photoshop CC and Photoshop Elements 6+. As such, you need to have any of these installed in your computer PC or Mac in order to do any edits to the Easter card templates. You can choose to print the cards in the big pro labs, send them out via emails or post them on your social media pages with ease.